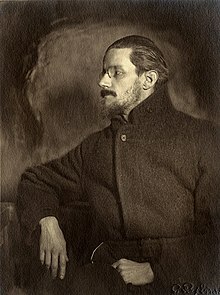 James Augustine Aloysius Joyce (2 Februar 1882 – 13 Januar 1941) wis an Erse novelist an poet, considered tae be ane o the maist influential writers in the modrenist avant-garde o the early 20t century. Joyce is best kent for Ulysses (1922), a laundmerk wark in that the episodes o Homer's Odyssey are paralleled in a variety o leeterar styles, maist famously stream o consciousness. Ither weel-kent warks are the short-story collection Dubliners (1914), an the novelles A Portrait of the Artist as a Young Man (1916) an Finnegans Wake (1939). His ither writins include three beuks o poetry, a play, his published letters an occasional jurnalism. Joyce wis born in 41 Brighton Square, Rathgar, Dublin, intae a middle-cless faimily. A brilliant student, he briefly attendit the Christian Brothers-run O'Connell School afore excellin at the Jesuit schuils Clongowes an Belvedere, despite the chaotic faimily life imponed bi his faither's alcoholism an unpredictable finances. He went on tae attend Varsity College Dublin. In 1904, in his early twenties, Joyce emigratit tae continental Europe wi his pairtner (an later wife) Nora Barnacle. Thay leeved in Trieste, Paris, an Zurich. Awtho maist o his adult life wis spent abraid, Joyce's feectional universe centres on Dublin, an is populatit lairgely bi chairacters that closely resemble faimily members, enemies an friends frae his time there. Ulysses in pairteecular is set wi preceesion in the streets an alleyweys o the ceety. Shortly efter the publication o Ulysses, he elucidatit this preoccupation somewhit, sayin, "For myself, I always write about Dublin, because if I can get to the heart of Dublin I can get to the heart of all the cities of the world. In the particular is contained the universal." ↑ The seicont name wis mistakenly registered as "Augusta". Joyce wis actually named an baptised James Augustine Joyce, for his paternal grandfaither, Costello (1992) p. 53, an the Birth an Baptismal Certificate reproduced in the airticle an aa shaws "Augustine". Ellman says: "The second child, James Augusta (as the birth was incorrectly registered) ...". Ellmann (1982) p. 21. This page wis last eeditit on 22 Dizember 2018, at 09:33.